I have listed a new property at 14 51028 RGE RD 261. 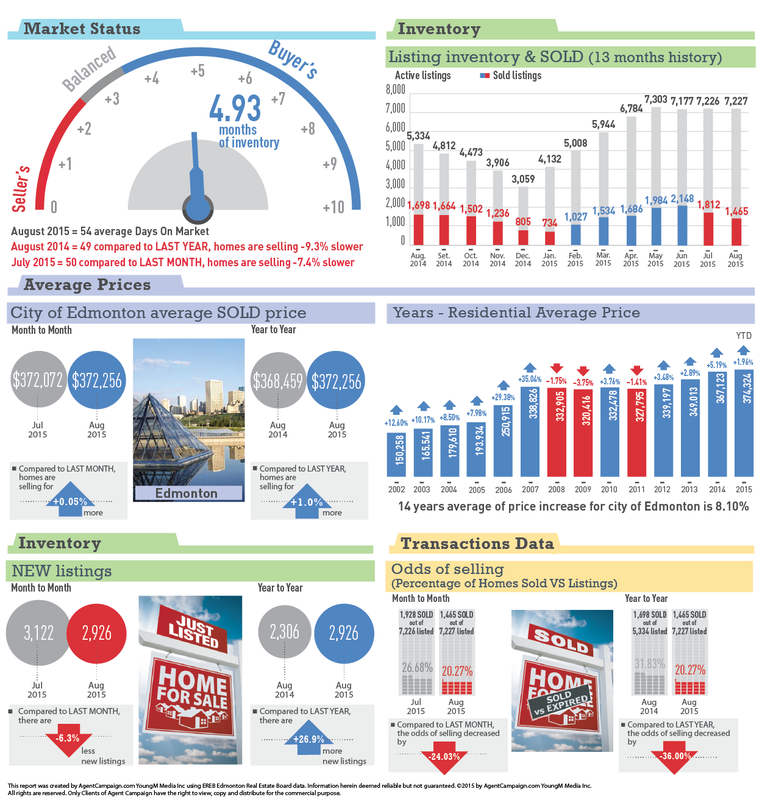 Edmonton, September 2, 2015: The average residential price in August for the Edmonton Census Metropolitan Area (CMA) is up 1% year-over-year (YoY) and down slightly by 0.2% relative to last month. A single family home in the Edmonton Census Metropolitan Area (CMA) sold for an average of $439,829; up 0.7% from July and up 1.0% YoY. The average for all residential properties sat at $372,256; down 0.2% from July and up 1.0% over last August. Sales continue to lag behind last year in all areas except duplex/rowhouse. An increase in availability of duplex/rowhouse options has helped this category grow over last year in sales (up 1.7%) and price (up 1.53%). Condos continue to be the hardest hit, with sales down 7.7% and average prices down 2.8% from last year. Sales of all residential properties reported last month are down 5.6% from those reported in August of 2014. Single family home sales of 884 were down 4.3% YoY compared to 1,111 reported last month. Inventory remains strong at 7,227 for the Edmonton CMA at the end of August 2015, up 35% from last August. All residential listings were up YoY by 26.9% but down by 6.3% from last month. There is currently just under five months’ supply of inventory in the Edmonton CMA. Average days on market for all residential properties was up again this month at 54. Single family average days on market was up to 52 from 48 in July. Condominiums were averaging 56 days compared to 54 in July, and duplex/rowhouses took an average of 52 days to sell in August.